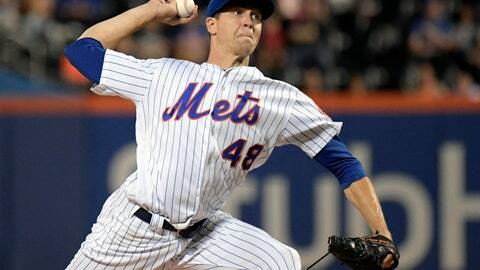 NEW YORK (AP) — Jacob deGrom says he has not yet chosen a new agent after Brodie Van Wagenen left his agency to become Mets general manager, and the NL Cy Young Award winner is open to discussing a contract extension with New York. Speaking on Wednesday night after being awarded his first Cy Young, deGrom said he is still “trying to figure everything out” after Van Wagenen gave up his career as an agent to deGrom, Yoenis Cespedes, Todd Frazier and others to become the Mets’ general manager last month. Mets chief operating officer Jeff Wilpon has said there are provisions in Van Wagenen’s contract “to deal with any conflicts of interest.” Some players and rival agents have expressed concerns about Van Wagenen flipping labor-relations roles.